Again I would like to drag your attention to the ‘Somewhere over the Rainbow’ hunt. Faster Pussycat made a mini collection of 4 amazing outfits for that crazy and colorful hunt. Today I would like to spotlight the “Lady Rainbow Pantsuit”. Honey Bender and PoosyKat LittleBoots really became crazy with the rainbow theme. The pantsuit is shoulder free and super cool scarf, that is part of the outfit, makes a perfect addition to the suit. 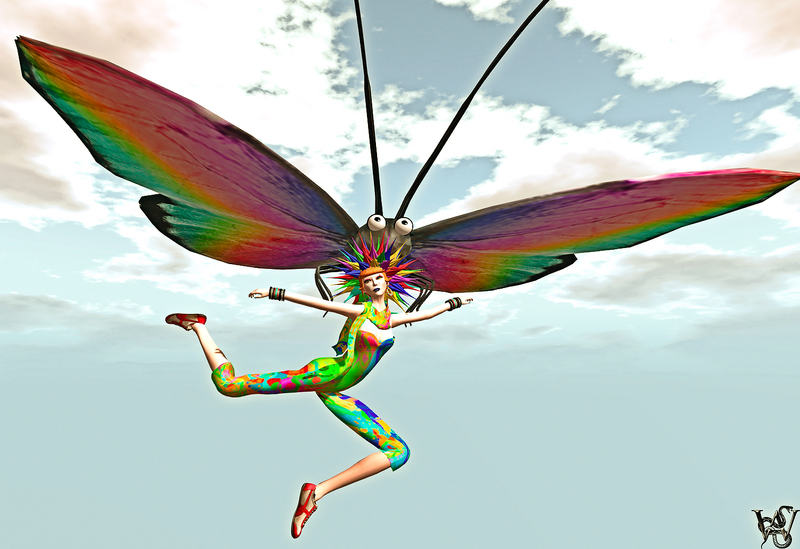 The huge dragonfly as well is part of the ‘Somewhere over the Rainbow’ hunt and comes from Studio Sidhe, a super cool poses and prop store. The huge colorful dragonfly works like a glider. you just have to sit on the bar and you can fly all over the grind with the amazing hunt gift. If yxou would take a closer look at the hands now… I would like to drag your attention to my nail polish. Malicia Python, owner an designer of Silken Moon made a huuuuge palette of various colors for the SLINK hands. The shine of the nailpolish is really amazing and so awesome realistic! You should really take a look at the Silken Moon Mainstore and see all the beautiful colors. The incredible realistic shoes are made by ENNA. The sneakers really caught my heart, as they are so well textured. The “ENNA Sneakers” for women are available in different colors, wich you all can see at the ENNA Mainstore. For the hair I cheated a little bit. I took the white version of the “Octavia” hair from Zibska, and colored all the single parts in the same bright col9ors, that I found on the “Lady Rainbow Pantsuit” from Faster Pussycat. For the makeup, I decided to go with a mix of the amazing “Cool Pink” eyes from LovelyMi and the “Wicca Lips Blue Steel from Silken Moon. 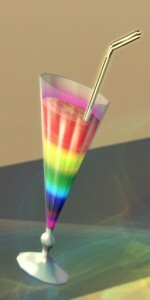 Somewhere over the Rainbow in Second Life or “Wicca in Wonderland”? What happens when color meets your favorite creators in Second Life? For me, the usually black loving person it was not immediately comfortable to be so colorful, but one by one I got used to it. First I added the yellow version of the “Piccadilly Overknee Boots” from LeeZu when I came across the super cool “Codie” hair from Discord Designs. It had a rainbow colored version in it and it was going perfectly with the “Valentina” corset from !dM. Each hair color of the gacha coes with a “Ripley” black hairbase. The “Codie” hairstyle was made for the gacha at the ’24’ event and usual colors will follow at the Discord Designs Mainstore after the event. To add my little rebel to the whole look i decided to go with one of the newest tattoos from White Widow. Julie Hastings made some new body tattoos, wich as well come with a tango applier for all those who love the new mesh boobies. The “Somewhere over the Rainbow” hunt is definitely worth a try, as many amazing designers put incredible colorful items for the hunters. Follow the rainbow trail to 15 fantastic designers and get a taste of their passion for colors – this list is intentionally super short, so you don’t have to TP around like mad. We want you to have fun with it!